Many things people commonly believe to be true about education are not supported by scientific evidence. Urban Myths about Learning and Education examines commonly held incorrect beliefs and then provides the truth of what research has shown. 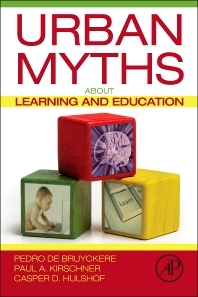 Each chapter examines a different myth, with sections on learning, the brain, technology, and educational policy. A final section discusses why these myths are so persistent. Written in an engaging style, the book separates fact from fiction regarding learning and education. Recognize any of these myths? These myths and more are systematically debunked, with useful correct information about the topic in question. Myth 4 If You Can Look Everything Up, Is Knowledge so Important? So, What Exactly Do We Know about Learning? Does It Help to Have a Correct Knowledge of How the Brain Works? Why are these Myths so Persistent? How Can I Avoid Believing Myths or Passing them on to Others? Into the Future: What About the Myths to Come? Pedro De Bruyckere (1974) is an educational scientist at Arteveldehogeschool University College, Ghent, Belgium (www.arteveldehs.be) since 2001. He co-wrote several popular books in Dutch debunk popular myths on GenY and GenZ, education and pop culture. Pedro is an often asked public speaker, one of his strongest points is that he is funny in explaining serious stuff. Pedro is often asked in media in both Belgium and The Netherlands on topics of both education and Youth and was mentioned by Dutch Magazine Vrij Nederland as one of the most influential voices in educational debates. Paul A. Kirschner (1951) is professor of Educational Psychology and Director of the Fostering Effective, Efficient and Enjoyable Learning environments (FEEEL) program at the Welten Institute, Research Centre for Learning, Teaching and Technology at the Open University of the Netherlands as well as Visiting Professor of Education with a special emphasis on Learning and Interaction in Teacher Education at the University of Oulu, Finland. He is an internationally recognized expert in his field. A few notable examples of this is that he was President of the International Society for the Learning Sciences (ISLS) in 2010-2011, his election to both the ISLS CSCL Board and the Executive Committee of the Society and the fact that he is an AERA Research Fellow (the first European to receive this honor). 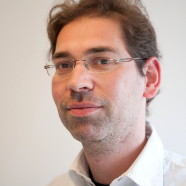 He is currently a member of the Scientific Technical Council of the Foundation for University Computing Facilities (SURF WTR) in the Netherlands and was a member of the Dutch Educational Council and, as such, was advisor to the Minister of Education (2000-2004). He is chief editor of the Journal of Computer Assisted Learning, associate editor of Computers in Human Behavior, and has published a very successful book Ten Steps to Complex Learning (now in its second revised edition and translated/published in Korea and China). He also co-edited two other books (Visualizing Argumentation and What we know about CSCL). Casper Hulshof (1973) has a PhD in educational sciences, and works as a teacher at the faculty of Social Sciences at the University of Utrecht, The Netherlands (www.uu.nl). He specializes in courses on educational psychology, research methodology, and philosophy of science. To him, the most important points about effective teaching are humor and making the connection between classic theory and contemporary research. He is an active user of social media where he likes to discuss science and pseudoscience, and tries to bridge the gap between educational research and educational practice. Authors have the expertise to deconstruct popular, but unfounded assumptions about media use in teaching and learning. Today a critical analysis of the use of digital media, especially smartphones, is needed, since many teachers, lecturers, and professors, do not throw a sceptical eye onto the enthusiastic trends of digitalization. The book selects some aspects, called Urban Myths, which are widely spread and shared by many, but nevertheless wrong, and the authors confront them with scientific empirical research and psychological theory.